After a sharp bend park at a field gate(1 car only) at R94525 53427 A. Go over the gate and immediately right up an old disused forestry entrance.After a few hundred meters you will reach a new forest track, turn right and follow this to R94565 52881 B, a crossroads, directly ahead look for a firebreak which will bring you to to R94538 52826 C.
Turn right along an overgrown but passable track to R94603 52698 D and then up a rough ride covered in sedge grass. 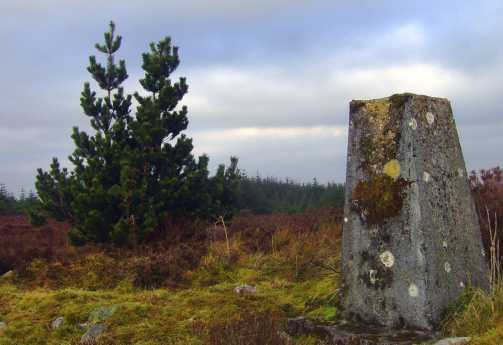 As the ground flattens out towards the top of the hill go left , skirting pools and rough ground to the summit trig pillar atop a mossy cairn. 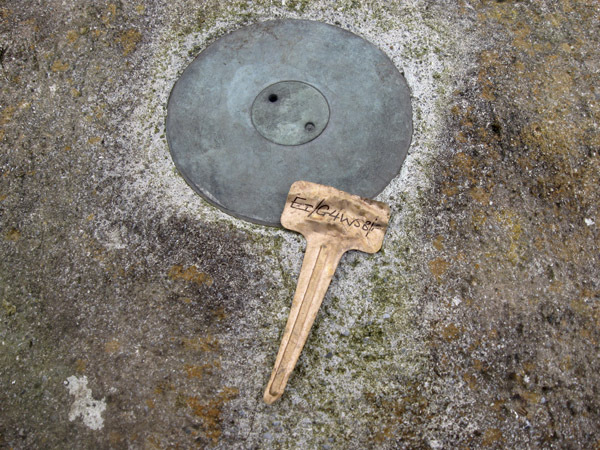 Whilst visiting Knockbane last weekend, this otherwise mundane summit did have an item of interest: at the base of the trig pillar was a small metal marker with the inscription "EI/G4WSB/P".